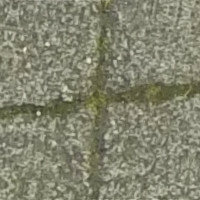 Given one image that could be a rotation of another image, what is the best rotation angle? The problem could be solved by trial and error, comparing one image with rotations of the other. This page shows a more direct method that is faster, though more complex. See also By FFT, what rotation?, which applies the method on this page to FFT results, finding rotation that is invariant to other factors. We crop a photograph, rotate it, and crop both these images to 300x200. The method requires that the images are the same size, and assumes that the centres of the images align, that is, the rotation is around the centre. We de-polar both images. This is like taking foam pipe insulation and unrolling it. 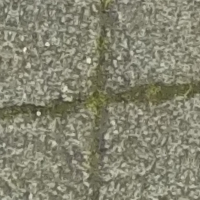 The image centre is spread out to the top of the new image, while pixels at the maximum radius are squished together and become the bottom of the new image. 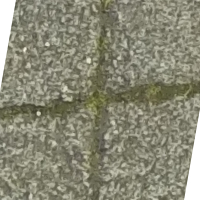 The corners of each source image won't appear in the new image. Depolar 0 has discarded all pixels outside the inscribed circle. Search for the second depolar within the first. As the two images are the same height, this doesn't take a massive length of time. The best match is found at x-offset 83 pixels. 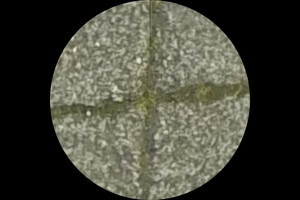 As the width of the images (before doubling) is 300 pixels, which represent 360°, the subimage is found at 83/300 * 360° = 99.6°. Subimage searches return integer results, so the margin of error is 0.5 pixels in either direction, so we know the true result is really between 82.5/300 * 360° = 99.0° and 83.5/300 * 360° = 100.2°. We can supersample to increase quality (by reducing the squishing at the bottom). 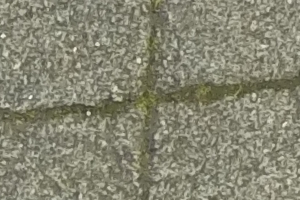 Multiplying by π (3.141..) would keep the pixels at the edge of the circle at the same scale. For simplicity, we scale by 4. Supersampling also increases precision of the result. Search for the second within the first. Supersampling has a cost: there are four times as many image-by-image comparisons, and each image comparison has four times as many pixel-by-pixels comparisons, so the time is increased by a factor of 16. We could crop the supersampled large image to correspond to the first solution, plus of minus the margin of error. The score obtained from the depolar images isn't usually important. More useful for onward processing would be a score of the source images, after rotating the first. If we rotate the first image by 99.9°, it should match the second image. The match can be seen more readily if we crop both images to the same degree. We crop the second image by applying the reverse rotation and then the forward rotation, following each rotation by a crop. If the sources were square, this would result in identical shapes. This score is slightly worse (higher) than the score reported for the depolar images above. 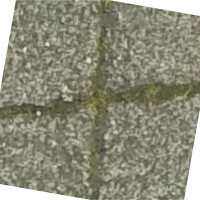 The depolar version gives a greater weight to the pixels near the centre of the image. Conversly, this comparison is biased by the white triangles, which are virtual pixels. A fairer comparison may come from using mirror for virtual-pixels, which requires us to use "-distort SRT" for the rotation. 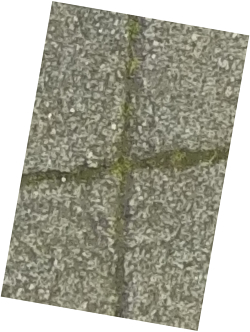 Yet another comparison is to take a 50% crop from the centre of each image. This entirely avoids virtual-pixel problems, for all angles, which is particularly important if we need to rank comparisons for various image pairs. On the negative side, this method of comparison clearly ignores much data from both images. On the plus side, it ignores data that occurs in one image but not the other. It is, for some purposes, the fairest comparison. If requested, the script returns this value as wrSCORE_SUB. If we don't want supersampling, set wrDO_SUPER=0 before calling the script. If this environment variable is not set, small images will be supersampled. The true angle lies between wrANGLE - wrANGLE_ERR/2 and wrANGLE + wrANGLE_ERR/2. If wrDODGY is returned as 1, this would mean the best scale found was either the specified minimum or maximum, so the actual best scale is probably outside these limits. The value of wrSCORE is the comparison metric returned by the subimage-search of the unrolled images. 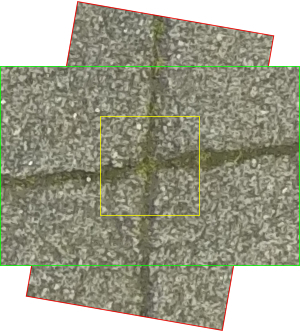 The value of wrSCORE_SUB is the fairer comparison between the first image rotated by the calculated amount and the second image, cropped to a square half the size of the smallest dimension. Calculating this takes extra effort. Instead of using IM's compare directly, whatRot.bat calls the script srchImg.bat which does a series of searches at different resolutions. This is more complex but much quicker. 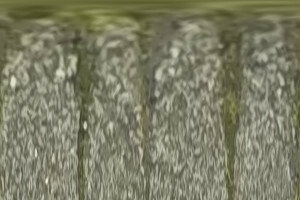 In theory, it might give the wrong result: the best result found at a low resolution might not be the best at full resolution. I've never see this happen with ordinary photos or video frames. For details of srchImg.bat, see the page Searching an image. the area that is used for the score in yellow. As described above, the script srchImg.bat does subimage-searches through a series of image pairs, successively reducing the subsampling (by resize), using each result to make a crop for the next search. In theory it can latch onto the wrong result at a small scale and this can't be corrected at a larger scale, so the final result will be wrong. This leads to whatRot.bat returning a wrong angle. 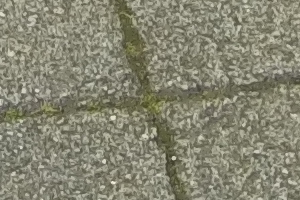 I've never seen this happen for ordinary photographs or video frames. However, it does happen for FFT spectrum images, because these contain very little low-frequency data so the initial shrinking to a small size can remove all useful data. In addition, the whatRot.bat script will crop both inputs to wrCROP_PC percent before unrolling. When the inputs are FFT spectrums, the effect is to remove high-frequency data from the search. wrCROP_PC=25 seems to work well. See the page By FFT, what rotation? This page was inspired by Grayscale Template-Matching Invariant to Rotation, Scale, Translation, Brightness and Contrast (pdf), by Hae Yong Kim and Sidnei Alves de Araújo. Rotation, Scale, Translation-Invariant Template Matching. rem finds angle of rotation for %1 to best match %2, and a score. @rem   wrDO_SUPER      if ==0, no supersampling will be done. @rem   wrDO_SCORE_SUB  if ==0, wrSCORE_SUB will not be found. @rem   wrDELTEMP       if not 0, will remove temporary file. @rem   wrCROP_PC       percentage for central crops before unrolling . @rem   wrANGLE     (degrees) rotate first image by this to match second. @rem   wrSCORE     (0.0 to 1.0, more or less). @rem   wrSCORE_SUB (0.0 to 1.0, more or less). @rem   wrDODGY     0 or 1. 1 means the result is unreliable. Source file for this web page is whatrot.h1. To re-create this web page, run "procH1 whatrot".